9302 GX Coin mech Coinco changer this unit will replace any MDB 6 pins 34 volts changer such as 6510 or 6512 MEI. 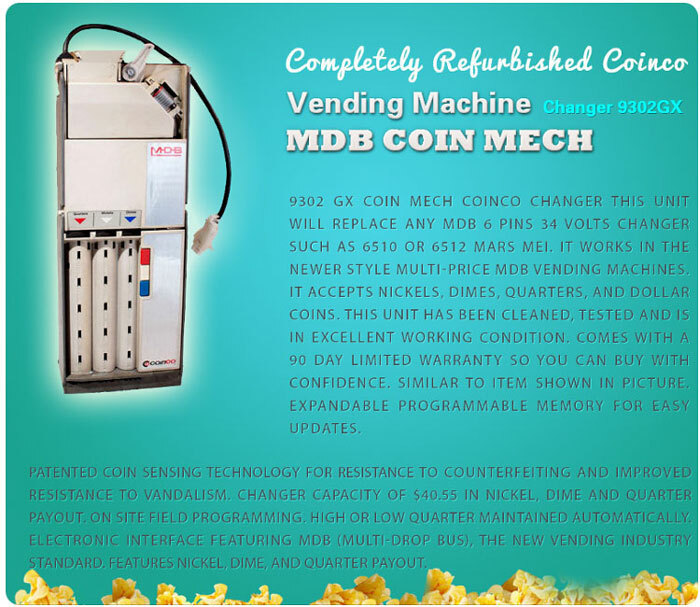 It works in the newer style multi-price MDB vending machines. It accepts nickels, dimes, quarters, and dollar coins. This unit has been cleaned, tested and is in excellent working condition. Expandable programmable memory for easy updates. Patented Coin Sensing technology for resistance to counterfeiting and improved resistance to vandalism. Changer capacity of $40.55 in nickel, dime and quarter payout. On site field programming. High or low quarter maintained automatically. Electronic interface featuring MDB (Multi-Drop Bus), the new vending industry standard. Features nickel, dime, and quarter payout.